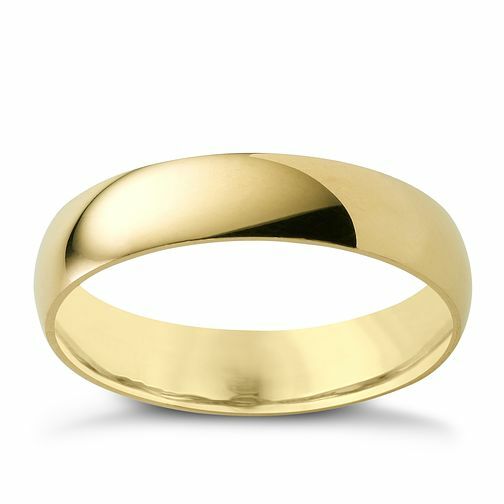 This extra heavy weight wedding band measuring 5mm is crafted in 18ct yellow gold creating a smooth, sophisticated ring. A stylish accessory designed to mark the start of your new chapter. 18ct yellow gold 5mm extra heavyweight court ring is rated 5.0 out of 5 by 2. Rated 5 out of 5 by Anonymous from Simple elegance and comfort Simple classical design makes it look very elegant. Being court shaped makes it more comfortable and pleasant to wear. Rated 5 out of 5 by Anonymous from Beautiful Wedding Ring We bought our engagement ring from Ernest Jones - a leo diamond 18 ct. There was only one place we wanted to buy our wedding rings from. We bought Bride and Groom Wedding rings, that matched and the wedding ring complimented the engagement ring beautifully. The wedding ring symbolises love with no begining and no end and we feel our rings are classically simple but so meaningful. We choose to engrave our rings with our initials and wedding date. We are so happy with our choice and would recommend these to any bridal couple.